CASA DA SERRA DO PILAR - idéalement situé,très calme,décoration soignée,tarifs dégressifs selon la durée,Entièrement rénovée,en plein coeur de la citie.Apartment with the best view of the Porto city and the Douro River.The apartment is composed of bright rooms,laid out in a contemporary and designer style. Its two separate bedrooms are an undeniable advantage for visitors looking for accommodation that is ideal for 6 people. This unit is a 3-minute walk from the Douro riverside area, where guests can go on boat tours, visit the Port wine cellars or stroll along the boardwalk. The apartment is a 6-minute walk from Dom Luís I Bridge. Featuring scenic views over Porto and the Douro River, this bright apartment features a living area with a flat-screen satellite TV. The unit comes with an equipped kitchen, private bathroom and a washing machine. Guests are welcome to prepare their own meals in the equipped kitchen of the apartment. The riverside area has a wide range of regional and international restaurants for guests to choose from, most providing meals with a Douro River view. The Aliados Avenue in the Porto centre is a 10-minute drive away. Galerias de paris, the city’s main bar area is a 9-minute drive, as is the famed Clérigos Tower. Porto International Airport is a 16-minute drive away from The best view of the city of Porto. Featuring scenic views over Porto and the Douro River, this bright apartment features a living area with a flat-screen satellite TV. The unit comes with an equipped kitchen, private bathroom and a washing machine. This accommodation is ideal for 4 adults. Two additional adults can be accommodated on a double sofa bed in the living room. 25€ A DAY 1 PERSON. 2 PERSONS 70€, after 2 15€ PER PERSON -, BUT IS BETTER TO CONTACT US BECAUSE WE CAN MAKE A DISCOUNT ON THE PRICE. 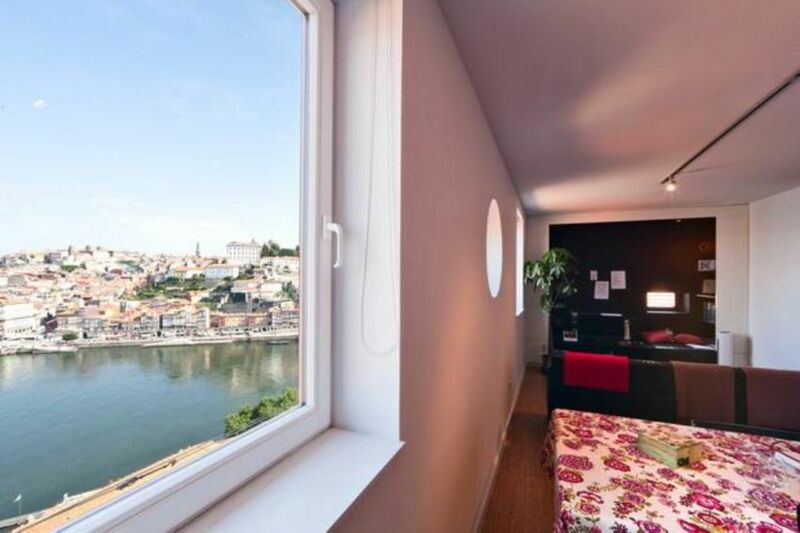 Magnifique séjour à Porto avec cet appartement bien équipé et propre et sa vue dont on ne se lasse pas sur le douro et la vieille ville tout en étant à une 10aine de minutes à pied de ceux ci. Miguel, le propriétaire, est très accueillant, disponible et "réglo". L'appartement est à proximité du métro aérien et du funiculaire (qui ne fonctionnent pas la nuit) dans un quartier calme. Nous avons passé d'excellentes vacances de Pâques en famille. TSB = tudo super bem! The views are as good if not better than advertised! Great location in Porto and Miguel was a charming and welcoming host. Great stay! Apartamento super confortável, com toda a estrutura para crianças pequenas e com uma vista maravilhosa! Mercado, farmácia, padaria e metro bem pertinho! Único porém é a rua estreia para estacionar carros. No mais, apartamento de fácil acesso e o Miguel é uma pessoa super simpática e atenciosa. Adoramos e voltaremos! Super recomendado! Everything was okay and we loved our stay in Porto. Miguel, we´ll come back!!! Eine wunderbare Ferienwohnung mit einem wunderbaren Vermieter, wunderbarer Aussicht, wunderbarer Ausstattung. Kein Kritikpunkt, der mir hier einfallen will. THE HOUSE IS PERFECT FOR 4 PERSONS, It should be noted that in addition to 4 adults -WE CAN ALSO ACCOMMODATE TWO EXTRA ADULTS IN A SOFA BED (1,40M X 1,80M) IN THE LIVING ROOM WE ALSO HAVE TWO CRIBS ON REQUEST FOR TWO BABIES. CANCELLATION POLICY - In case of cancellation the reservation is not returned. - Reduction in the number of nights - 1 to 15 days prior to arrival: 1/3 of 1 night's price/NIGHT. - Reducing the number of guests - up to 15 days advance the equivalent to one night stay/guest. CLEANING AND MAINTENANCE - The apartment will be cleaned before the arrival of each guest. - When leaving, the guest must leave the apartment without waste and with the lights and TV off. BEHAVIOR - The person that reserves the apartment will be responsible for the conduct of all the persons accompanying him/her, and specifically avoiding any activity that is against any law or health policy. - Do not forget that our apartments are in residential buildings, the night rest of its neighbors must be respected. Observe that the conduct of parties or other activities that disturb neighbors may result in immediate eviction from the apartment with loss of all amounts already paid for the stay at the apartment. - The quiet period lasts from 22:00 to 10:00 the day following.